More than 27 million American women have low bone mass, putting them at risk for osteoporosis according to the latest research. Around nine million women are currently living with osteoporosis according to the National Osteoporosis Foundation. Women up to age 50 need 1,000 mg of calcium daily; 1,200 mg for those age 51 and older. Low-fat or non-fat dairy, including milk, cheese or yogurt are great sources of calcium and according to a new Canadian study could reduce the risk of Type 2 Diabetes and obesity. Researchers from Laval University and CHU de Quebec Research Center discovered that overall metabolic health could be linked to the consumption of milk-based foods. The new findings can be found in the journal Applied Physiology, Nutrition, and Metabolism. 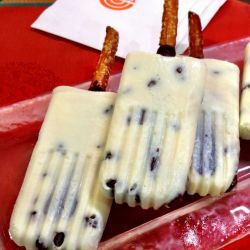 A healthy and low calorie treat chocked full of calcium is Isabel Minunni’s recipe for yogurt-chocolate pretzel pops. At less than 170 calories per pop, they make a great treat for every member of the family. With a double oven, melt 1/2 cup chocolate chips. Coat one end, halfway up, of each pretzel with melted chocolate. Place on foil or parchment paper to harden. Meanwhile, in a large bowl, thoroughly mix yogurt, vanilla, honey, and remaining 1/2 cup chocolate chips. Scoop yogurt mixture into 14 desired pop molds. Place in the freezer for about 30 minutes. Place a pretzel in each mold, with the chocolate-coated side into pop, and place back in the freezer to completely freeze — about 6 hours. Place ice pop mold’s tips in warm water to remove yogurt pops. Enjoy! Makes 14 pops; each serving contains 167 calories, 4 grams protein, and 1.5 grams fiber. You can use any good yogurt in this recipe, but I have a favorite for several reasons. Prairie Farms represents over 700 farm families and their distribution system covers over 30 percent of the United States! The Prairie Farms products are free of artificial growth hormones. Plus Prairie Farms charitable giving program, Our Caps, Your Cause, supports a variety of non-profit organizations enabling consumers to support their favorite nonprofit. The “Our Caps, Your Cause” program gives consumers a say in where the donations go. Learn more about how Our Caps, Your Cause, supports a variety of non-profit organizations at prairiefarms.com. This entry was posted in Uncategorized and tagged “Our Caps, calcium, cheese, Danita Blackwood, diabetes, Low-fat, milk, National Osteoporosis Foundation, non-fat dairy, non-profit, obesity, osteoporosis, Prairie Farms Dairy, Type 2 diabetes, Yogurt, yogurt-chocolate pretzel pops, Your Cause” by Danita Blackwood. Bookmark the permalink.